Grevillea (Grevillea spp. ): growing, planting, caring. A beautiful South-African shrub - only for warm climates. Scientific name : Grevillea spp. Full description for Grevillea spp. not yet available. 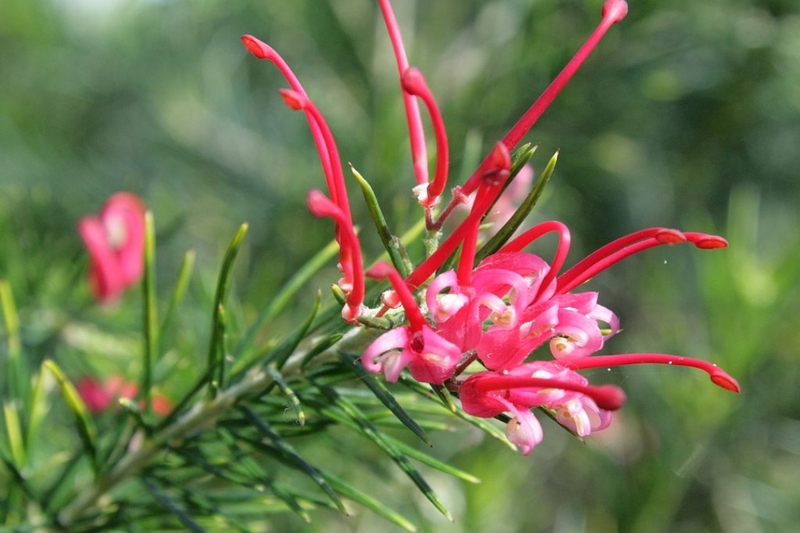 Grevillea are evergreen shrubs from Oceania and South Africa. This genus has 250 species of evergreen trees and shrubs. They have linear or needle-like leaves in whorls around the branch. The flowers are devoid of petals, and are grouped at the end of the branches. These terminal inflorescences are a bit like red, pink, yellow or orange spiders. The trees can be very tall - up to 35 m - and the shrubs can take a creeping port. In open ground, plant preferably in autumn, possibly in early spring, outside periods of frost. Find a sunny location in ordinary drained soil - even sandy or stony - acidic or neutral. Make a hole 1/3 wider than the root ball, not mixing the soil layers. Add heathsoil if your soil is calcareous. If your Grevillea waited a long time, if you have to wait, plant it without burying the plant collar, which is the limit between roots and branches, then water copiously. Mulch to avoid weeding. In pots, plant in a mixture of garden soil and sand, in a pot matching the size of the adult plant. If your winters are harsh, bring in your Grevillea before severe frosts, not necessarily in a heated room. Take out your grevillea after the last severe frosts. If you keep your potted Grevillea, plan for a surfacing every 2 to 3 years, which involves replacing the topsoil with mature compost. Between April and August, shorten the twigs by a maximum of 1/3. Renew mulching in the fall at the base of your Grevillea to limit weeding. A mulching with wood is ideal.